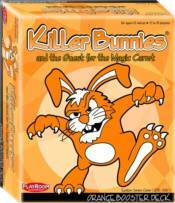 Killer Bunnies are back yet again, featuring even zanier Specialty bunnies and introducing the Pawns (which will reveal the secrets of the P-Cards)! The Orange Booster Deck adds 55 cards to your existing set, plus six multi-colored Pawns. Other fantastic cards include: Weil's Pawn Shop to give players a chance to buy back bunnies from a third Killer Bunnies market, Double Free Agents to make Bunny Triplets even easier, Selective Disclosure to reveal your opponents' cards before they're played, and Uriel's Machine to counteract any undesired Very Special card! Can you reap the benefits of a Super Supplies Surprise? Aggravate your opponents with a forced "Do-Over" turn with Bunny On The Edge Of Forever! The Orange Booster Deck delivers increasing scopes of strategy and more twisted ways to win!